Nyekek is a fruit from South East Asia. 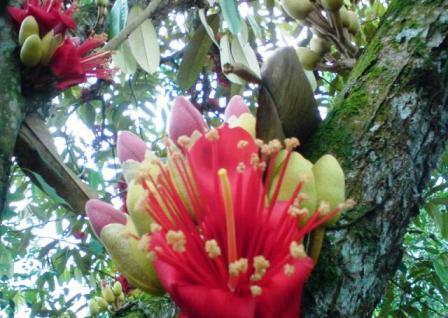 It seems to have been originated in Borneo where it grows wild in large numbers. 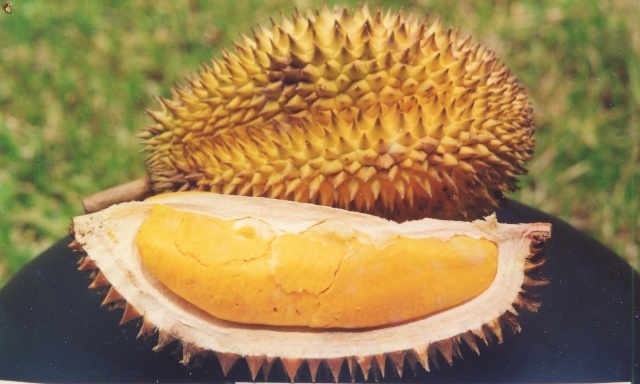 Besides Borneo, the fruit can also be seen growing wild in parts of Java, Sarawak and Sabah in Malaysia and Brunei. Nyekek is cultivated on a small scale in Indonesia for its fruits. Nyekek trees are also planted in many gardens for landscaping. 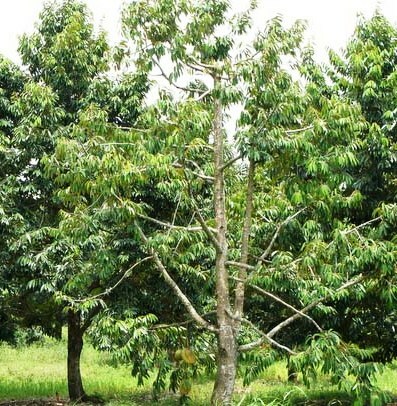 A small to medium-sized tree up to 30 m tall, with bole branchless up to 12 m and up to 40 cm in diameter having low, rounded buttresses; bark surface initially smooth and hoop-marked, later rather rough and flaky, grey to reddish-brown. 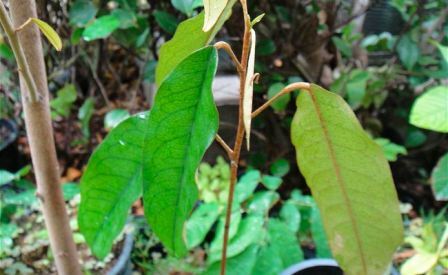 Leaves alternate, simple, elliptical-oblong, (10-) 20-33 cm x (3-)6-12 cm, densely pale golden-brown scaly below, penni-veined, ventral surface silvery-golden. Fruit an ovoid to ellipsoid, pentangular capsule, up to 20 cm x 12 cm, outside dirty yellow, covered with slightly curved soft spines 1-1.5 cm long. Seeds ellipsoid, up to 4 cm long, glossy brown, completely enclosed by a fleshy, yellow, sweet-smelling aril. The fruits are edible and often offered for sale along the roads and in small village markets. Wood is used as timber and sold as durian wood. It is quite strong wood. As already stated, nyekek is cultivated for its fruits. This tree has a preference for fertile clay rich soils. However, it cannot tolerate water logging. New trees of nyekek are raised from seed. The seedlings grow fairly fast Cultivated trees start fruiting when 4-5 m tall.